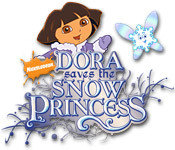 Dora`s back, and this time she`s off to explore the frozen places of the world so she can rescue the Snow Princess from a really mean witch. Guide Dora through an enchanted land filled with hidden clickable puzzles, exciting sleigh rides, and whole lot of winter fun! Join the adventure and save the Snow Princess before winter is gone for ever!